Every trip out to the veggie garden is more of an inspection than a culling feast these days. The soil temps are in the eighties and the bug meter is off the charts. Still... not too shabby of a morning's harvest for a vegetable garden on a rapid decline. I must say I've been pleasantly surprised the last couple of weeks while the plants hang on for life. Each basket of veggies is one more delight I didn't expect. I'm quite thankful, too, for the black cherry tomato plants that volunteered their way up through the soil this spring. None were planted by the gardener but there are several at this point providing plenty of salad candy. Just after mentioning my wish that the swallowtails would find the parsley... they did. Yay. Probably more like I found him ... this fellow has been around for a while. Last weekend we enjoyed all the grand-kiddos at the same time. We swam, we ate pizza outside, we played games, we watched a movie, we braided hair, painted toesies and just had lots of kid-fun together. Children are marvelously invigorating and inspiring to have around. Each of them, in their own special and individual way, has an appreciation for the garden. Early in the morning our granddaughter sat with her Papa outside in the garden. Him with his coffee, her with her hot chocolate. They were just relaxing and chatting it up about flowers and plants... and every other thing on a little girl's heart. 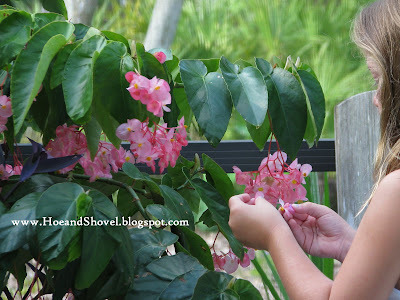 I love it that her small, gentle hands love to touch the soft petals of flowers near by. It seems fitting to give these little beauties more blog time. I already posted about them here if you'd like more information about the Butterly Orchid's characteristics. I'm still getting so much enjoyment from their continual blooms each time I pass them by. The tiny but colorful blooms on Butterfly Orchids are intricate and fascinating. Each flower hardly a full inch from one petal tip to the other. So delicate and wispy they are dangling from the oak tree they are attached to. I've taken so many photos of them still trying to capture the essence of them. Maybe it's just me but a plant that needs no soil or extra water and yet provides such simple beauty deserves lots of admiration. Meems, I knew I would be hungry after reading the title of this post. Your last pickings are still looking good. So are those orchids. Like you I think they should be admired as often as possible. And your Grands in the garden. How could life be more appreciated than through the eyes and hands of the Grands. I hope you have a wonderful weekend too. Your garden keeps on giving Meems. must be nice to have fun with the grand kids I don't have any as yet and don't see any yet on the horizon. I adore swallowtails and am sorry that we do not have any here. Have a wonderful weekend and say hello to Mr Meems for me. How did you attach those orchids to the tree Meems. They are so beautiful! Yum, Meems, your veggies look So good. 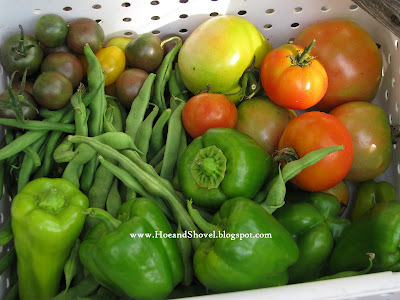 There's nothing like fresh veggies from your own garden. Enjoy your grands while they are young. My grandgirls have visited us almost every summer 'til this year. They are now teens and too busy. The oldest one is working and the younger one is playing softball. Sniff Sniff. meems...gotta love that ongoing veggie garden...quite a nice bit of colour still, too. it's true the grands and small children have a unique way of bringing an added pleasure to the garden...sounds like you all had wonderful time together. so great to capture that s/b caterpillar...it will be nice to have the butterfly in a bit of time. i am glad to see your tiny orchids still bringing you some blooms...lovely. Your veggies are just beautiful. I planted a Black Cherry tomatoes this year, so I'm looking forward to tasting them! 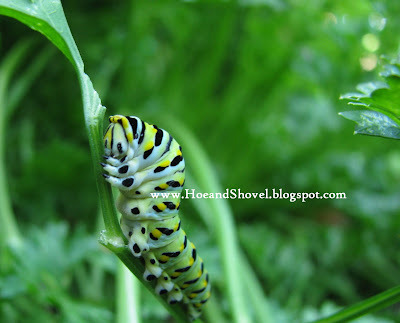 The swallowtail caterpillars are every bit a beautiful as the butterflies they become, in my humble opinion. I think there's a lesson in there for us....Every stage in life has a special beauty and should be embraced. I miss my granddaughter and would love for her to spend an afternoon with me in my garden. I saw a big toad this week and so longed to share it with her. 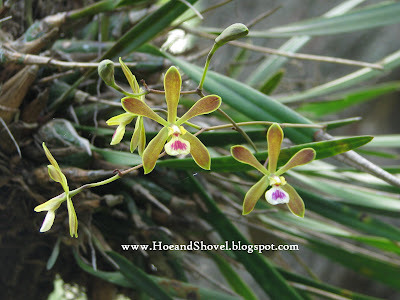 I was able to purchase a clump of the same butterfly orchid as your beautiful specimen. I got mine last summer, and mine isn't looking so good. I'm trying to figure out if that's the natural tendency, or if I'm in real trouble. I have mine mounted on fern bark, and it's living with all of its cousins on a crowded patio. Could you give me some tips on what I need to be doing to get it on the road to blooming again? 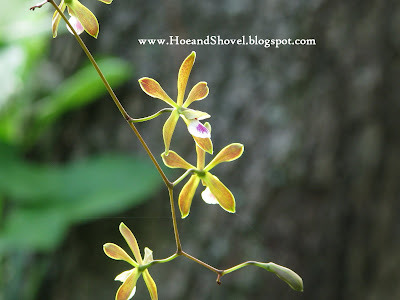 Hey Meems, love your Butterfly Orchid! I bought one last summer, and it's not doing too well. Dropping leaves and just looking poorly. Would love some tips on getting it back to a healthy state. I wish I had some good advice for you but honestly I don't *do* anything to my butterfly orchid. It is a product of the elements it is exposed in each season with no help from me. They are not particularly lush plants until they begin to bloom. I wish you luck with yours.